Some 40 years on, the groundbreaking music of Pink Floyd sounds fresh and deep, and the lyrics of Roger Waters are as relevant as ever. How hard is the balancing act between music and politics? 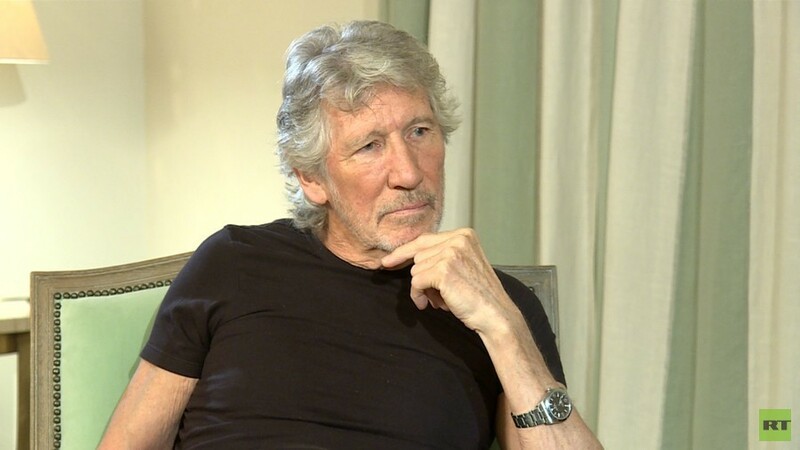 We talked to the legend himself – Roger Waters, musician, activist, and co-founder of Pink Floyd. Sophie Shevardnadze:It’s really great to have you with us today. Welcome to Russia. SS: I’m really happy that you’re here. I’m looking forward for your tour and I’m looking forward for our little chat. So I’m going to start with the eternal question because you have been pushing the boundaries of music forever, but at the same time, the lyrics that you write are always very powerful, so the question is: what is more powerful - the word or the music? RW: Well, the way that I see it they have equal importance. I mean, the trick with songs - I’m not quite sure where it comes from, but it’s to do with the way that the feelings that are in the lyrics of the songs and the ideas that are in the lyrics of the songs somehow get kicked into a more accessible place by having to relate to the metre of the music. I don’t know. It’s a kind of magical thing. I feel a bit like I’m kind of pulling the wings of a butterfly even to talk about it because it’s so mysterious. You know, writing songs is a sort of a mystery how it happens, why it happens with the connections made in between the heart, the soul, the brain and the intellect and the nature, if one is intellectually inquisitive about the world the one lives in and so on and so forth. It’s just the way of being alive. SS: You get this question a lot in different forms, but I never really quite grasped an answer. For instance, if you go to a Paul McCartney concert, who’s a great musician and a friend of yours from what I gather - you forget about Syria and sanctions for one night. And you have that little space of three hours to think about love and heartbreak, family, friendship… You would never be ok with giving your audience just that. What is it about? Does music always have to be fused with a certain message, unless it makes no sense or is less important? RW: No, it’s not “has to” or “doesn’t have to”, I think. My father was dead, so I never really knew him. But my mother gave me a great gift when I was a child. She said that the only thing that was fundamentally important to her was to care for other human beings, to empathise with others. For instance, she was a school teacher, she had my brother and I to bring up on her own and she was very political. If she would go to a political meeting often in the evening she would drag us along with her. We would sit there at the British-China association or something. This is specific, and we would watch movies of the heroic struggle of Mao and the Long March and the Chinese people fighting against the Japanese and the puppet government of Wang. But often the meetings in Cambridge where I was brought to, would be in a Friends meeting house which is the home of the Quakers which is a religious sect. I never forget my mom said to me one day when we were leaving: “You know, what we are?” I said “yeah”, but I didn’t really. “It’s called the Friends’ meeting house, right? It’s the Quakers. It’s the Christian sect”, she said. “As you know, I’m an atheist, so I can’t subscribe to their religious beliefs. But they are very good people.” And I thought: “Wow, how cool is that!” I can still hear her saying that. SS: So I guess you’re very much like your mother from what you describe. RW: I have her hands. SS: Well, and you’re very outspoken, you always say what you think, you’re very adamant to get your message through. You’ve been political for all your life from day one of your career. And people now are saying, maybe Waters should just stick to music. They didn’t really say that before, and I wonder why it has become so pervasive now. Has your message changed? Has it become more acute? Why are they all of a sudden realising that Roger Waters along with great music is political? RW: Because they’re sleepwalking. Because they’re asleep. Because they’re are the victims of the neo-liberalism that Ronald Reagan and Margaret Thatcher brought to the world, and it has spread so pervasively, certainly through the Western culture, the Western politics and things. The part of the way it works is to anaesthetise people and almost make it uncomfortable for people to see anything real. You know, it’s difficult for some people. I do get people. In America people are walking out of the show - not many, maybe 4 or 5 out of twenty thousand, but nevertheless - “why doesn’t he just shut up and play the music?” You know, I sometimes speak to them because I speak to the audience in most places where I play now. Sometimes I’m a bit playful. RW: Unfortunately we don’t educate ourselves or our children well enough. I live in the United States of America, and the United States of America spend nothing on public education. And the reason they do that in my view - I’m always ready to be wrong about everything - they want to keep the electorate ignorant, and mindless, and unthinking, and malleable, and pliable, and very open to the use of consumerism and propaganda to keep them under control, to maintain the Orwellian notion of the sheep and whatever. RW: That’s true. But we have to remember that 40 years is sort of irrelevant in terms of history of homo sapiens and sometimes in terms of thought and the way things develop and the potential we have to change systems. First of all, you have to go back to saying “I’m glad that I was born after the Enlightenment”, if you like. I’m glad the French Revolution happened a couple of hundred years ago so that we can have the Déclaration des droits de l'homme in our back pocket if we wanted. I agree with that. That is a good thing. This is something that I can cling to. But then it puts us to something different. Then the people who would suggest that I shouldn’t be political or rock-n-roll shouldn’t… What are you talking about? What should or shouldn’t be - it’s none of your business! You cannot come or you can come, but you can’t influence me with an opinion about something. It’s not your music, it’s my music. It’s not your job, it’s my job. It’s my life. This is what I do, and this is what I’ve always done. If you thought you were a fan of Pink Floyd and you didn’t notice that it was what I did when I was running Pink Floyd, you’re an idiot. But I don’t want to hear. Life’s too short for me to listen to idiots. I’m not interested in their opinions. I’m interested in the opinions of people who are thoughtful, or caring, or have something about them. There are certainly people that you meet and talk to, and it’s like reading a great book. SS: How does that make Israel’s government change their mind? SS: Still, there’s another side to the story and that’s just regular Israelis and some of them still come to your show, they did not even vote for Netanyahu, they are not for settlements. How fair is it to punish them? RW: People are telling me that unfortunately still there’s a huge majority of Israeli Jews who believe that the policies to Gaza and in relation to the settlements and building permits are fine. They don’t see a problem with it. This is a big big majority of Israelis, maybe not the Israeli Arabs who are 20% of the population. In this 80% there’s a resistance. I know many of them, they’re friends of mine. But it’s not huge numbers. RW: I’ll tell you just a couple of things, we could be here all day talking about White Helmets because that is a very deep rabbit hole. For a start, there’s no evidence to support the idea that that’s a grassroots organisation in rebel-held territories in Syria that grew up from people who just wanted to go out and help civilians to get out of bombed buildings. No evidence to support that. So that’s one thing. When I made my speech - I gave a little speech in Barcelona - the other thing is the French guy who supports the White Helmets and goes around the world climbing tall buildings wearing a white helmet. And he said: “I want to come on stage and give the message to the children of Syria “we haven’t forgotten you”. Can I come on it?” And I said: “No, you can’t come on stage and say that.” I mean, I’m sure he’s sincere and whatever. But I explained why. My gig was on April 14th this year in Barcelona. On April 7th it was alleged that there was a chemical attack in Douma in Syria. And the video appeared with people hosing down children, kids with masks on their faces and all that, made by White Helmets. And the White Helmets sent this video, and it went viral, etc. Only on evidence of that video the governments of the United States of America, UK and the Republic of France all decided to go and bomb Syria. Just on the basis of that! I stood up on stage and said: “I think it will be a huge error to go and bomb airfields in Syria until we know what happened.” The United States, UK and France did send a hundred cruise missiles to Syria. I don’t think it had done much damage. Thank goodness they didn’t kill people. But they did do that. And then people left. The next day two journalists went in - Robert Fisk who works for The Independent, a reputable British news broadsheet, or rather tabloid, and also a strange journalist who was working for a conservative Christian TV station from Texas, his name was Pearson Sharp. They both went extensively all over Douma. They both went to hospital where the video was shot, and everybody told them the same story. Absolutely nobody knew anything about any chemical attack. Doctors said: “There was no chemical attack; we had a few people in there who had dust in their throats, there wasn’t a single death in Douma on that day.” Nobody was killed, certainly nobody was affected by chemicals of any kind. These are two independent journalists in there and sending out those reports that were unequivocal. I believe them to be true. Funny enough, the official chemical weapons inspectors went in four or five weeks later with all that stuff and their report came out. They said they couldn’t find a single trace of any nerve agent. They found chlorinated something - I can’t remember how it was phrased which could be salt or anything. So the official report is now out - nobody read it, it wasn’t news, you couldn’t see it on CNN because it’s not the narrative that they follow. Their narrative is that there was a chemical attack and the White Helmets are wonderful. I just have to say this one more thing, I emphasised this in Oslo, and I will say it whenever this comes up: if there’s a grassroots body called the White Helmets of volunteers separate from the people who actually started in Istanbul - it wasn’t started in Syria, it was started by an English soldier in Istanbul, - but if that body exists and they go and help people after either Assad or the Russians or somebody else drops bombs on them, I’ll support them wholeheartedly with every fibre of my being. But all the evidence points to the fact that it’s not the reality. Did you see the documentary that won the Oscar? RW: I mean, have you ever seen anything so obviously scripted, carefully shot and put so that it looked like a documentary that came out from a war-torn...? RW: Of course, they say that. RW: Do you think I don’t get it when I’m being attacked for being on RT? SS: I don’t even know if you like Putin or not, but why is that someone who doesn’t express an opinion that’s in line with the State Department is like a scarlet letter, branded “Russian spy”, or, like, a Kremlin sympathiser, as if you can’t think for yourself? RW: Clearly the warmongers are doing this because they want to promote an idea of having war with Iran first and maybe Russia second. There’s a lot of money in war. I know that this sounds like crazy conspiracy theory stuff, but it’s not - why are they spending 600 billion dollars a year going into foreign countries that are none of their business killing brown people and Muslims? Why? What’s it for? You know, if you start asking and put “Why?”... Is that because you’re scared that they can attack you or because they hate your freedom? I mean, the U.S. narrative is nonsensical in every possible way. Yeah, they’ll probably throw me out eventually of the country. SS: Do you think so? SS: Do you feel that danger? RW: I feel that people are trying to silence me - obviously on the BDS issue. They’ve been trying to silence me! They threaten to me as well. SS: Where would you go? Would you go back to Britain? RW: If I didn’t live in the United States? I don’t know. No, I wouldn’t go back to the UK. Maybe Portugal. SS: Would you come to Russia? Why not Russia? SS: Because it’s a great country. RW: Maybe you’re right. I’ve no idea. SS: Can I ask you another thing - have you noticed the general line and the leeway that the American officials allow themselves to have when it comes to speaking about the Russians? I’ve just heard this American politician say “Russians are genetically driven to co-opt and penetrate” - and I was thinking “Oh my God, if any American especially officials were caught saying this about the Jews or the African Americans that would be the end of their career.” Why is it ok and why is it allowed to speak about Russians like that? SS: I think it started during Obama period, it became really bad during the presidential campaign and it’s gotten even worse ever since Trump is in office. SS: Why won’t you run for office? RW: Because I have important things to do in my life. SS: Well, ok, along with those important things thanks a lot for talking to us. Stay tuned on RT because I like you watching us. SS: Good luck with everything.